= Minna itsumo kono saito ni kite kurete arigatou! = Thank you, everyone, for always coming to this site! Today’s lesson is about 有り難う / ありがとう（ = arigatou),Thank you! It is one of my favorite words! In this lesson, I will teach you how to express our appreciation properly in Japanese. Let’s check the kanji first. So it originally means it is rare or difficult to have something or exist.So not to take it for granted to receive kindness or gifts because it is rare and appreciate it! Ex. 有り難き幸せ ( = arigataki shiawase) (Classic Japanese) To be grateful for you happiness. →I am very grateful for my happiness. = It helped me a lot. = It was a great help for me. I really appreciate it. = I appreciate your thoughtful words but…. •~は有り難い。( =~ wa arigatai) = help me a lot. ~ is a great help for me. I appreciate ~. = Ame no naka eki made mukae ni kite moraeru nowa arigatai. = I appreciate them picking me up at the station in this rainy weather. = We have to appreciate just being employed these days. •有り難いことに ( = Arigatai koto ni) Thankfully…/Fortunately/Luckily..
= Arigatai koto ni ashita wa nichiyoubi da. = Thanks God, it’s Sunday tomorrow! = Arigatai koto ni sono jikan(ni) mada ginkou ga yatteita. = Fortunately, the bank was still open at that time. = Konna mono wo moratte mo arigataku nai. = It’s hard to feel grateful for a gift like this. = Hitori gurashi nanoni konnani ippai no tabemono wo moratte mo arigata meiwaku da. OK, now we will lean how to say thank you in Japanese. •有り難う / ありがとう ( = Arigatou) Thank you! You can use both kanji and hiragana. = Thank you so much. = Senjitsu wa arigatou gozaimashita. = Thank you very much for the other day. But let’s imagine you are invited to a party and you want to thank the host at the entrance before the party starts, what would you say? = Kyou wa omaneki itadaki arigatou gozaimasu. = Thank you for inviting me today. = Kyou wa omaneki itadaki arigatou gozaimashita. = Thank you for having invited me today. 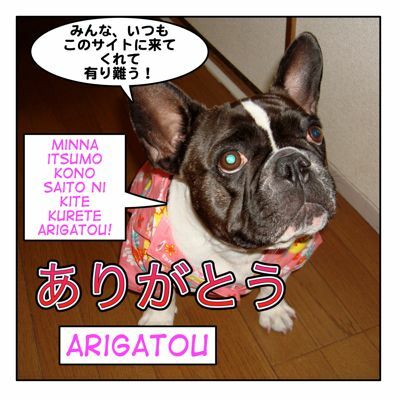 ありがとう/有り難う ( = Arigatou) can be used both for the present and past situation. = Kono aida wa arigatou. = Thanks for the other day! = Kono aida wa arigato(u)ne. = Sutekina purezento wo kudasatte arigatougozaimasu. = Thank you for giving me the nice present! = Thank you for giving us(or sharing us) your precious time. = Thank you for giving me the precious things the other day. Note : A lot of time we omit an object particle “を ( = wo) ＋the main verb ” such as くれる ( = kureru), 頂く ( = itadaku), etc. in conversation. = Thank you for your support! Omitting the particles often happen in conversation. But some just leave を ( = wo) in the sentence and omit the main verb , くれる ( = kureru) 頂く ( = itadaku) = giving etc..
= Oishii keiki wo arigatou! = Thank you for the delicious cake! = Oishii keiki wo kurete arigatou. = Thank you for giving me the delicious cake. This を ( = wo) is an object marker for the main verb (くれる = kureru) and not the object for Thank you. = Thank you for the wonderful present. = Thank you for giving me the wonderful present. = Kichou na ojikan wo arigatougozaimashita. = Thank you for your valuable time. = Kichou na ojikan wo itadaki, or saite itadaki arigatougozaimashtia. = Thank you for sharing your valuable time. Since you omit the main verb, just leaving the particle を(=wo) in the sentence is considered to be grammatically wrong. Still we use this sentence pattern often to emphasize the object. However you need to be careful because sometimes it sounds unnatural. = Kore (wo kurete) arigatou! You might have seen these types of dramatic lines from the titles of songs or advertisements after big events such as sports events, concert, etc. = Yume (or kandou) wo arigatou! = Thank you for the dreams (moving us) . = Yume wo ataete kurete arigatou! = Thank you for giving us dreams. = Ii omoide wo arigatou! = Thank you for the nice memories! = Thank you for making the nice memories. = Ii omoide wo tsukutte kurete arigatou! = Sutekina jikan wo arigatou! = Thank you for the wonderful time! = Sutekina jikan wo tsukutte kurete arigatou! = Thank you for creating wonderful time! It would be strange if you omit を ( = wo) in these types of phrases. = Thank you for coming. = Thank you for teaching (me). = Thank you for helping (me). = Thank you for inviting. = Oishii ryouri wo tsukutte moratte arigatou. = Thank you for making delicious meal! Please check the くれる lesson for more! = verb te-form + kudasatte+arigatou gozaimasu. = Thank you so much for teaching (me). = Thank you so much for coming in this bad weather. Note : 足元が悪い ( = ashimoto ga warui) 足元 ( = ashimoto) means under foot which means ground. When it rains, the ground gets wet and muddy and makes it hard to walk. So this expression shows appreciation towards a person who has come a long way in bad weather. = Okaiage itadaki arigatou gozaimashita. = Thank you for buying. = Honseihin wo okaiage itadakimashite makoto ni arigatou gozaimashita. = You will see this phrase in any instruction manual for products you’ve bought. = Goraiten itadakimashite makoto ni arigatou gozaimasu. = Thank you for coming to our store. = Thank you for your thoughtful consideration. = Ohoneori itadakimashite arigatou gozaimashita. = Thank you very much for your hard work. Note : 骨折る ( = honeoru) literally means to break one’s bone. Conversationally it means to trouble, to do hard and tough work. To emphasize thank you, you add, どうも ( = doumo)、本当に ( = hontouni)、心から ( = kokorokara) in front. = Hontou ni arigatou gozaimasu. = Hontou ni arigatou gozaimashita. = Goshinsetsu ni arigatou gozaimasu. = Goshinsetsu ni arigatou gozaimashita. = Sono setsu wa arigatou gozaimashita. Culture note : If you have receive a gift, it is considered to be polite to say thank you to the person who gave it to you the next time you see them as well. If you really appreciate it, you can combine them. = Hontou ni iroiro arigatou gozaimashita. = Thank you so much for everything. = Goshinsetsu ni doumo arigatou gozaimashita. = Thank you so much for your kindness. You can add 本当に ( = hontouni) very much, truly , 心から ( = kokoro kara) sincerely, 深く ( = fukaku) deeply in front to emphasize your appreciation. = Konotabi no koto wa hontou ni kansha shite orimasu. = I really appreciate you regarding this issue. = Kansha no kimochi de ippai desu. = I feel very grateful. = (~ni) fukaku kansha shite imasu/orimasu. = I deeply appreciate it. I sincerely appreciate your kindness. I sincerely appreciate your doing me a favor. I truly appreciate your had work for this matter. I would like to thank you from the the bottom of my heart. Thank you for the meal. Thank you for the meal. It was delicious. Also if you receive some food, you can tell them how yummy it was later. ( = Kono aida itadaita keiki hontou ni oishikatta desu. Gochisou sama deshita. Thank you for the cake the other day. It was delicious! Note : We say お世話になります。( = Osewani narimasu.) before you anticipate someone will do you a favor or take care of you. Thank you in advance. Thank you for coming all the way. Thank you for coming despite all the trouble. Thank you for your loyal patronage. 真に／誠に→まことに In business letters, we are supposed to use hiragana. We often say “I’m sorry” instead of saying “Thank you.” in Japanese to show that we feel bad about receiving. *すみません。( = Sumimasen) I am sorry. →Thank you. I am sorry to trouble you all the time. →Thank you always! *申し訳ないです。( = Moushiwake nai) I am so sorry. I feel terrible. I really feel bad for always receiving things from you. You can also say these when someone give you compliments instead of saying Thank you. Go check my 恐れいります( = osore irimasu) lesson. •ご親切に ( = Goshinsetsu ni)You are so sweet. That’s very nice of you. That’s very nice of you. Thank you! = Goteinei ni arigatou gozaimasu. = Thank you for your politeness/courtesy. •お陰様で。( = Okage sama de) Thanks to God,thanks to yo. = Mou okarada yoku nararetan desu ka? = You feel better now? = Hai, okage sama de. = Congratulations on the wedding. = Okage sama de arigatou ogzaimasu. = Okage sama de goukaku itashimashita. = Thanks to you (or God) I got passed the exam. = Okagesama de buji ni taiin suru koto ga dekimashita. Hontou ni arigatougozaimahista. = Thanks to you (God), I (or someone in my family) was discharged from the hospital without any problems. = Watashi ga koko made yatte koraremashita o mo minasama no gojinryoku ga atte koso desu. = Osewani natta hito ni orei wo iitai. = I would like to express my appreciation to a person who has taken care of me. = Minasama no gokyouryoku ni kokoro kara orei moushiagemasu. = We are sincerely grateful for all your cooperation. = We would like to say thank you again. = We are extremely grateful. In some occasions we give a present to a person who did a favor for us to show our appreciation. If you give some money, put the money in a white envelope and write 御礼 ( = orei) . We sometimes put thanks money, including some lesson fee in an envelope marked as 御礼 ( = orei). In many cases you can just say thank you and receive a gift but there is a certain case that you should be more polite. Here’s how. = Ieie, sonna koto wo shite itadaitara komarimasu. = Oh no..I would be in trouble if you do such a thing.→You don’t need to do that. Please don’t worry about that. = Please don’t do such a thing. = Mou sonnna goshinpai wa (nasaranai de kudasai. = Please don’t worry about that. = Sonoyou na koto wo shite itadaitara kaette moushiwake nai desu. = I would feel terrible if you did that. = Soudesu ka? Soredewa okotoba ni amaete..
= Sorede wa enryo naku choudai itashimasu. Mushiwake arimasen. = OK, in that case, I will take it without any hesitation. Thank you so much. = Itsumo itadaku bakari de sumimasen. = I feel bad because I always receive things from you. Note : If you really are the one who’s always taking, go check お返し(=okaeshi) culture in my Valentine’s lesson! The simple way to say thank you is, just express your happiness. = I was just looking for a thing like this. It’s perfect! = Choudo kouiu no ga shoshikatta nodesu. = It’s a great help! = It’s a great help. And, of course, don’t forget to say 「ありがとう！」 （ ＝ arigatou) Thank you! It’s a magic word! = Don’t mention it. You don’t need to thank me. = Iie otagai sama desu. = The feeling (of thanks) is mutual. = Oyaku ni tatereba ureshii desu. = I will be happy to be of service to you. = I am glad to be of service to you. = Iie sukoshi dake desu ga..
= No, it is just a small token. = This is small something. = It’s just small thing. arigatou!) Thank you, everyone, for supporting this blog! = Minaga tokidoki komento ni kaite kureru “Arigatou” no hitokoto ga hontou ni ureshikute tsuzukte imasu. = Your “Thank you” message in a comment would make me very happy and I’ll be able to happily continue these lessons! = Kyou wa Maggie kara ippai no arigatou! Hi Maggie Sensei! I heard someone use ありがたいね as thank you, and the internet said that it’s an old fashioned and informal way to say thank you. Is this true? What’s the difference between ありがたい and ありがとう? I see. The way you use ありがとう and ありがたい are a little different. When you simply want to say “Thank you!” to someone, you say ありがとう. Not ありがたい. While you say ありがとう to people who did/does something for you, ありがたい is used to show your appreciation to the situation, circumstances, things or event that help you. Christmas is just around the corner, so here are my wishes for you! Please be healthy, happy every day, keep supporting us with your knowledge about Japan’s culture and Japanese language and may all your dreams come true! And here’s also my little request for you. During playing Final fantasy IX <3 I come across an expression「かたじけない」, which also means「 ありがとう」. Could you tell us something about it? When is it used and who normally uses it? Thank you for your nice Christmas wishes for me. I hope you have wonderful Christmas holidays, too!! It is a typical samurai warrior’s speech. You hear this only in Samurai drama, animations or games or when you talk like samurai jokingly. I may add some of the expressions to say You’re welcome in future. Maggie-sensei, I’m sorry to trouble you with another question. I first need to write an email to my friend’s aunt who will show me around during my visit to Japan, but I wonder how I should open it? Would including something like 貴重なお時間をありがとうございました and 迷惑をかけてすみません。to convey that I’m sorry to trouble her and to thank her for making the time to see me. 貴重なお時間をありがとうございました may sound too formal for your friend’s aunt. 迷惑をかけてすみません is used when you actually cause some problems. How about 今日はお忙しい中、すみません/ ありがとうございます。 = Kyou wa oisogashii naka sumimasen/ arigatou gozaimasu. before she shows you around. thank you so much! your blog really helps a lot! I have a question, there was a Japanese thanking me but I don’t know what she was thanking for. If I want to ask her “why did you thanking me?” in nihongo, does this sentence なぜあなたは私に感謝しましたか？ has the exact meaning? Hello R! Thank YOU for visiting this site! “I am grateful for our friendship”? 私達の友情に感謝しています。= Watashitachi no yuujou ni kansha shiteimasu. Thank you for being my friend. = 友達でいてくれてありがとう！= Tomodachi de ite kurete arigatou! I am glad you are my friend = (your friend name)が友達でよかった！= ~ ga tomodachi de yokatta. I need to know the situation. Thank you for this wonderful lesson! You explain things very clearly, but I have one little question. Since 頂く is a more polite form of もらう, why is ～ていただき有り難う correct and ～てもらって有り難う wrong? Isn’t the degree of politeness the only difference between those two expressions? Is there some kind of explanation for this? Hmm I wonder why…let’s figure it out together. and though some people say that in certain cases in conversation, 〜もらってありがとう doesn’t sound natural. Thank you for getting some help from someone. Now when you use honorific expressions, technically we should use 下さる instead of 頂くbecause 下さる is a polite form of くれる. But we both use 〜頂きありがとうございます　and ~　〜下さり有り難うございます。nowadays even in business situations. It means more than receiving something, it shows the respect towards that person’s help. Now I understand. Thank you Maggie, you are the best! どうも有り難うございました for this incredible lesson. You gave many many great examples that are going to be more than usefull . Thank you for taking time to do this excellent lesson . Did you delete in Greetings lesson?? Which has been the first in the category daily life.. when click on it it just tells me page didn’t found. Sorry! I fixed the link. Sensei, may I throw some doubts in here? a) Does “honseihin” mean “the authentic product”? I can find the definition for “seihin” but not when attached with “hon”. b) Is the literal translation of this sentence: “We are really grateful that you bought the authentic product”? Sensei, I have seen “kake” used several times since I started learning Japanese. a) Does this word, when used with the “i-stem” hold the meaning of “getting into”, “being subject to” X action/verb? b) Is there a specific kanji version for this word when used in this manner? Or is it intended to be used with Hiragana? Is the literal meaning of this phrase something like “I will indulge in your words, I will take advantage of your words” and accept your present then. a) Can the literal meaning of this sentence be something like: “I don’t know how it would be ok for me to say thank you to you.”? b) “yara” is another way of saying “darou”, right sensei? Sensei, I think I get the words “fear/anxiety/uneasiness” and “enter”. Does it mean “I enter fear/uneasiness as I receive your favor/gift.”, as in “I am uneasy to receive this from you”? Sensei may have realized by now that I tend to ask a lot for the literal meaning of things in Japanese. I feel like knowing the literal meaning of the pieces which then conform the expressions allow me to have a better understanding of things and hopefull end up allowing me to play with the words in the future. I am sorry if sensei feels thess questions are somewhat annoying. Great! Someone has been studying. this やら is the same as のか or as you said だろう and it is unfinished sentence. And your translation is correct. So 恐れいる means “to be in awe” いる is to be into that condition deeply. It is just one dramatic expression. To figure out the meaning by the literal meaning does help understand the words or phrases. And all your questions are good. Not annoying at all. I recall reading sensei’s “honmono” lesson so sensei has just reinforced that lesson for me. Thank you sensei. Sensei, I recall hearing “hanashikakeru”, if I am not mistaken. Does this expression also have a negative connotation to it? Maybe it is has the nuance of “interrupting” what someone is doing by going to talk to them, right? 4) Oh I think I get it. yara = noka. It is a subordinate clause, like sensei teach me before, right? A question about this sensei, is “yara” by any chance a “casual form of “noka” then? Thank you sensei, as always. As I told you, there are many meanings of かける. Also やら shows one’s feeling of suspicion. どうなることやら… = I wonder what is going to happen. Got it sensei. I will try to do my best to identify what kind of “kakeru” is used in the context of the conversation. Thank you for this informative explanation of ways to express thanks and appreciation. I’m an advanced-level student of Japanese. I speak six other languages fluently, I’ve studied comparative linguistics and right now I’m living in Japan, using Japanese daily (speaking, reading, writing). When should or must one use を immediately preceding either of these phrases and when is it permissible to NOT use this direct object-marking particle? I added some information. It may not enough for you because I am not a linguistically trained dog and this site is just for fun but will keep adding inf whenever I get more examples. Thank you so much for all the insightful lessons. I’ve started watching Taiga dramas so, in this particular lesson, 有り難き幸せ was just the expression I was looking for. Oh, so you’ve been watching Taiga Drama? 有り難き幸せに存じまする！ is a very typical line to show your appreciation in Samurai dramas. The language is very different from modern Japanese, huh? I still need english subtitles to understand everything in dramas, but I can see the language in Taiga is different and I’m especially enjoying the use honorific and humble verbs. It’s very interesting and getting better with more vocabulary learned each episode. Haha! You can use 存じまする!!! I will forward your message to Victor. He might say かたじけない! Very nice!! I found this page today, very informative and in easy way . I learned a lot by reading this page, and I haven’t finished yet. I never thought of the actual meaning of arigatou , I never even know there is a kanji for it. thanks! Thank you for visiting our site! Hope you come back here again and again.